In Surah Kahf of Qur’an, we read that Moses (PBUH) was commanded by God to search and find Khed(z)r, a chosen servant of God. Moses was one of the Olol-Azm Prophets (Ibrahim, Noah, Moses, Jesus and Mohammad -PBUT- were the five Olol-Azm Prophets -Prophets with determination-, for interesting points regarding the Olol-Azm Prophets, we invite you to read “spring of hearts” in this site). Moses finally found Khezr, and as he was commanded, asked Khezr to let him accompany him to learn from his God-given Knowledge. But Khezr told Moses that he (Moses) did not have the patience to accompany him (Khezr) because being patient for unknown phenomena is difficult. Moses (PBUH) promised to be, God-willing, patient and not to ask questions until the reasons would be revealed for him. They went along together. Three significant events happened. For instance, they got to a river and to cross the river, they rode a boat; but suddenly Khezr damaged the boat for no apparent reason! Moses, being as fair as he was, could not observe any wrong being done against an innocent person therefore, he asked Khezr about the reason for breaking a boat belonging to a poor man earning an honest living. Khezr reminded Moses’s promise to him … . Two other cases happened and every time Moses(PBUH) was curious about the reason and finally after the third time, Khezr informed Moses that God had bestowed Divine Knowledge upon him regarding these cases. Khezr explained that he broke the boat because an oppressor -the ruler of that land- was about to take that boat and every working boat away from their owners therefore, he (Khezr) damaged the boat so that the oppressor would not take the boat away and the poor owner could fix the boat and continue earning his living from it. Khezr emphasized that he had done all those acts based on Divinely bestowed Knowledge … . Said one who had a Knowledge of the Book, I will bring it to you before the blink of your eye. Then when Solomon saw it placed firmly before him, he said this is by the Grace (Fazl) of my Lord… . This parable which we are about to use may not be very expressive or even correct, but one may say that each letter of Allah’s “Esm of A’zam” is probably an ocean of heavenly Knowledge and Power! It is important to mention that the “Esm of A’zam” is not the only way God bestows His Knowledge and … . Jesus (PBUH) was given less than 10 of those letters and by God’s permission, Jesus performed the miracles which are stated in Qur’an and Bible, such as healing, creating, raising from death and… . and Allah has bestowed upon you the Book and Wisdom, and taught you the Knowledge you had not, and Great is the Grace (Fazl) of Allah on you. I am the City of Knowledge and Ali is the Gateway to my Knowledge; as for any one who seeks the City of Knowledge and Wisdom, then he/she has to enter it, from its Gateway. The Prophet Mohammad (PBUH&HP) at the last moments of his life -in addition to all that he had taught Ali- whispered something in Ali’s ear. Ali said that the Prophet opened one thousand Doors of Knowledge for him and for each Gateway, one thousand other Doors were opened. What did the Prophet whispered in Ali’s ear ? We do not know but we know that Ali had the God-given capacity to carry heavenly Knowledge in him. Regular people do not have such a capacity; that capacity is only Divinely bestowed. 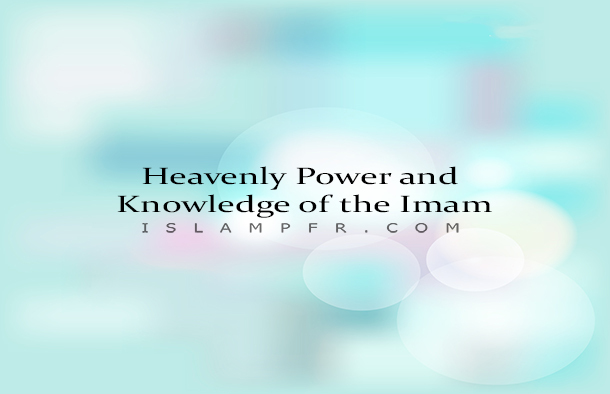 One day a person insisted to Imam Hossain (PBUH) to tell him one secret about the Imam’s exalted position. At first, the Imam refused to answer but the man insisted. Imam said something in his ear; suddenly, the man aged and became an old man; he did not have the God-given capacity to carry heavenly Knowledge. When the hypocrites (Abu-Bakr, Omar and…) insisted on their hypocrisy, the Prophet Mohammad (PBUH&HP) magnanimously decided to accept their outside (as they were pretending to be Muslims) and to leave their inside (their satanic thoughts and plans) to God. The angel Gabriel came down to the Prophet, and delivered Allah’s salaam to him, and told the Prophet that Allah wanted him to take those hypocrites -those who were breaking their Covenant with Ali and were planning to rise against Ali- outside Medina. Gabriel said that God wanted Ali, the prophet’s Allah-chosen successor, to show his Divinely bestowed Powers and Wonders -such as his walaayat and lordship upon mountains, sky, earth and other creations- to them so that they would know that Allah’s “waley” did not need them, and God would certainly revenge. After this heavenly message, the Prophet commanded those hypocrites (Monaafeqin) to go outside Medina and there, Ali (PBUH) was standing next to a mountain. Mohammad turned toward Ali and said : Surely God has commanded these people (hypocrites) to obey you; if they do so, they shall move toward Heaven and shall abide in it for ever but if they do not, they shall enter Hell and abide in it forevermore. Then the Prophet looked at that group (hypocrites) and said: know that if you obey Ali, you shall be blessed and blissful and if you disobey him, you shall be afflicted . By Allah’s command, through the things you shall see, Ali does not need you. Then Mohammad told Ali: in the name of Mohammad and his immaculate progeny -the progeny whom you are their lord after me- ask Allah to change the mountain into anything you wish. Ali -the same way the Prophet had said- asked God to change the mountain into silver. By God’s command, the silver mountain started to talk and said: O’ Ali, the Successor of Allah’s Prophet! God has ordered me to be at your command, you may spend me in your cause; anytime you wish, I am at your service. Then the mountain turned into gold and many more precious materials. BY God’s command, they all announced their readiness and obedience to Ali. Then the Prophet turned toward the hypocrites and told them to be aware that by God’s command Ali did not need any financial assistance from them. Then in the same manner, Mohammad told Ali to ask Allah in the name of Mohammad and his immaculate progeny -the progeny whom Ali was their lord after Mohammad – to change the trees into soldiers and … . Ali did so and they all announced their readiness and said to Ali: … surely, the God who has given these hypocrites time -in spite their heresy, oppression ,aberration, … – while they are disobeying you , is the same God who gave time to Pharaoh, Namrood of Kan’aan, to all who claimed to be gods and also gave time to Eblis (the head of Devils and the master of transgressions) … ; you and also they, are not created for this world rather, you are created for the eternal world … your Lord has Willed to show your greatness and superiority to them! Imam Kaazem continued : just like the Qur’anic verse says – in their hearts and souls are illness ...- hearts of those who break all covenants, those transgressors and non-believers, were rife with the disease of jealousy in regard to Mohammad and Ali when they were asked to pledge their loyalty to Ali (at Ghadir and…). Then based on Qur’an -… then God added to their illness…– then their hearts became rife with the disease of arrogance towards Ali and therefore, they encountered perdition. Qur’an continues that -… and for them shall be ultra-painful punishment for that they are liars. (Qur’an, Surah Baqarah, Verse 10) They denied the Prophet, and were lying when they said that they were firm in their allegiance with the Ahl-Ol-Bait… . And you do not Will unless He (God) Wills; surely Allah is All-Knowing and All-Wise. Today, Mahdy (PBUH) is the Imam and he has the same Divinely bestowed Power and Knowledge, but he also does as Allah wants therefore, he awaits his Appearance. Mohammad and his progeny (PBUT) are the perfect meaning of the true Servants of Allah, i.e. they always obey, and trust God. Our disobedience may cause Mahdy’s Appearance to happen later, rather than sooner. If we wish our names to be on the list of those who truly love and Anticipate Mahdi, should we not think, say and do in the deserving manner which will cause his Appearance to occur sooner rather than later?! Let us sincerely pray and strive for those wonderful days.